The Pen Habit would like to welcome our very first guest poster, Chris Curtis. Thanks for your contribution, Chris, and thank you for introducing me to this new ink! 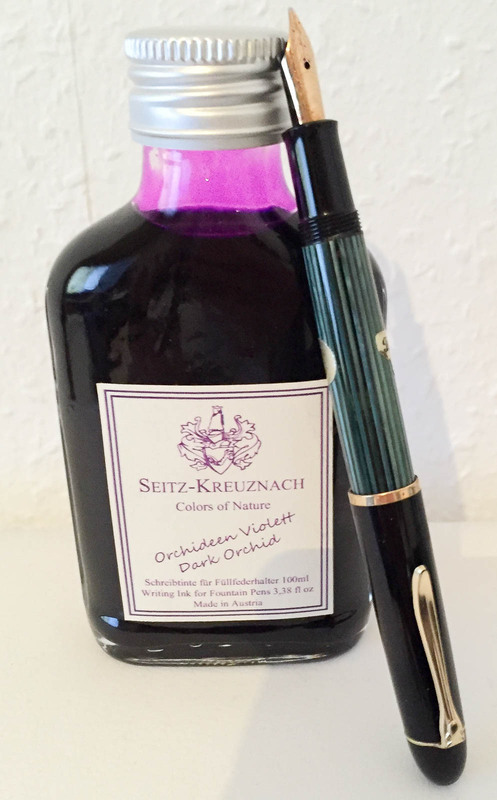 Orchideen Violett is an ink produced and sold by German pen and stationary shop Seitz-Kreuznach, based in Bad Kreuznach in Rheinland-Pfalz, Germany. 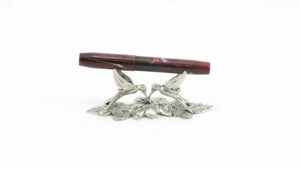 In addition to pens and ink, Seitz-Kreuznach also sells a plentitude of other things like knives and shaving equipment. International buyers might find them under the name “Seitz-Global,” to help with the difficult pronunciation of “Kreuznach” for non-German speakers. Sometime after opening in 2005 they started carrying their own ink produced in Austria, like Montblanc inks. 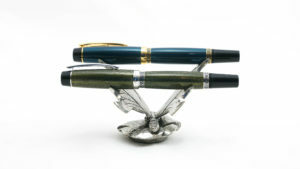 It’s possible, in fact, they may be from the same manufacturer, which would explain the astounding features of this ink. But I’ll get to that in a bit. There are nine colors in the Seitz-Kreuznach’s line of inks, which are sold in either 20ml or 100ml sizes. 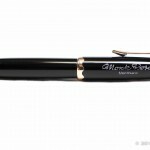 The large bottles, you see one in the picture above, have a nice, medium-wide opening that accommodates the nib on a Montblanc 149 without any trouble. 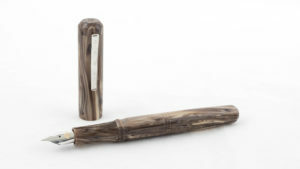 But since they are shaped like a bottle that you would normally drink something more potent out of, you might find that you can only use up the first half of the ink without having to decant it into an inkwell (or perhaps dropping the pen into the bottle only to have it swallowed up by Great White Ink Sharks.) 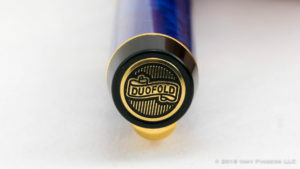 The 20ml bottles have more of a decorative value than anything else; it says on the shop’s page that the opening isn’t suited for filling a fountain pen. A cartridge converter or an ink syringe shouldn’t be a problem, though. Orchideen Violett belongs to the “Colors of Nature” collection. 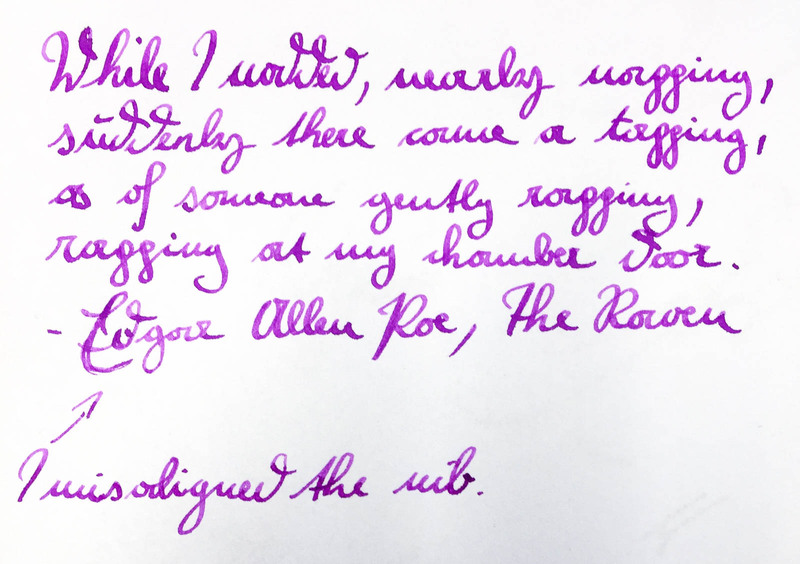 The ink is a quite saturated magenta color with hints of pink. The name “Dark Orchid” is fitting. On a Rhodia DotPad, laid down with my vintage Pelikan 140 and a flexible 14k gold BB nib, the ink pops off the page but is still quite easy on the eyes. The color reminds me of the violet orchids growing on the windowsill at my parents’ house. This is a color that you probably wouldn’t use for work, but rather for a nice letter sent to one of your friends. It is very vivid without ever getting boring or too crazy. Lubrication and flow are awesome; this is a very wet ink. 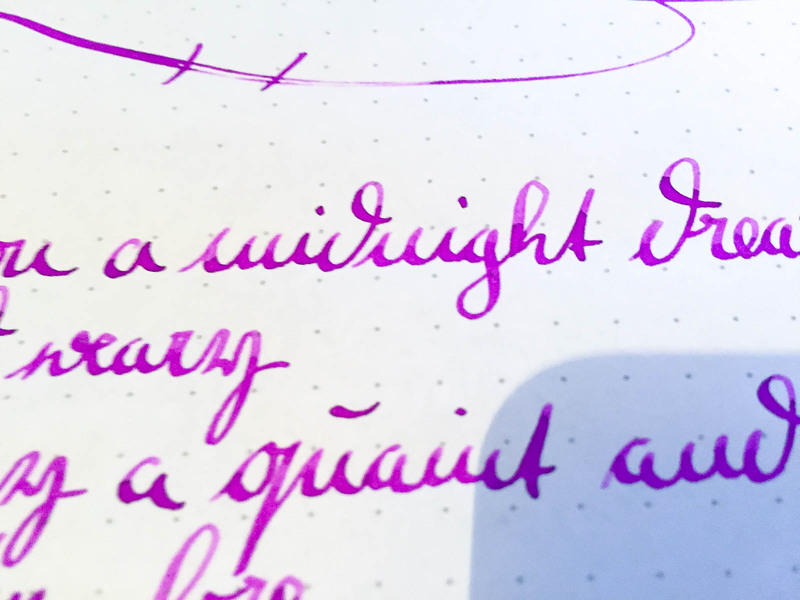 When using Iroshizuku Murasaki Shikibu (a somewhat similar color), my Pelikan 140 is a medium wet writer. With this ink, I would consider the same pen a wet writer. There is also a little bit of shading to be had with a broader nib. What really surprised with this ink me was the water resistance. In the first water drop test the water stayed on the grid for about two minutes but there weren’t any wafts of color rising up from the paper. Even with the extended soak, the lines got less saturated, but can still be seen as a light pink. In my second drop test the ink withstood the water for 20 seconds without any noticeable loss of color, so you don’t have to worry about spilling a glass of water on the paper or a little bit of rain. That being said, this ink cannot be called a bulletproof or permanent ink by any stretch of the imagination. On Rhodia, there is only a little bit of showthrough, and no bleedthrough at all—even on the scribbling at the bottom of the page. On cheap copier paper there is almost no feathering (see following pictures), but more showthrough and just a little bit of bleedthrough where my flexy nib put down a lot of ink. 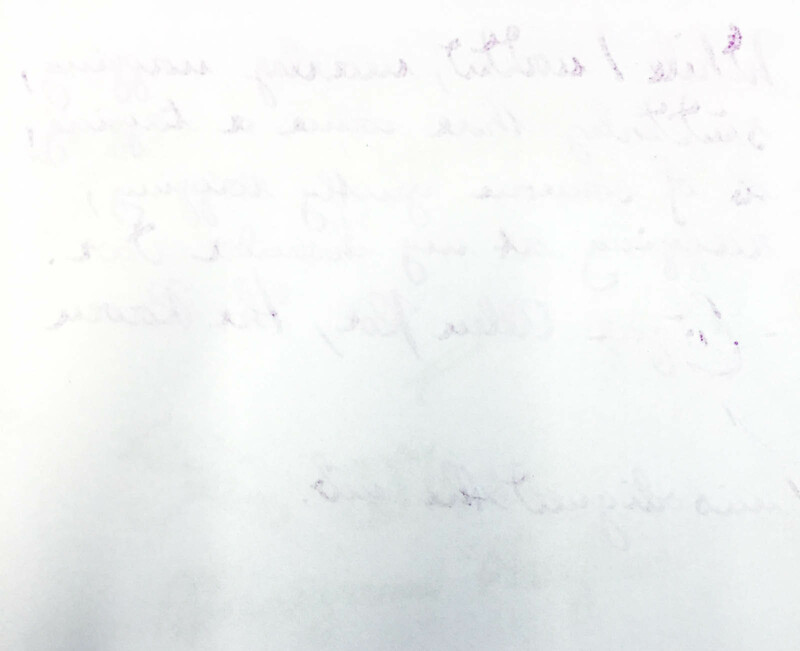 Again, with a wet ink and pen, a bit of bleed and show through is to be expected; for really copier paper, the ink’s performance is not bad at all. 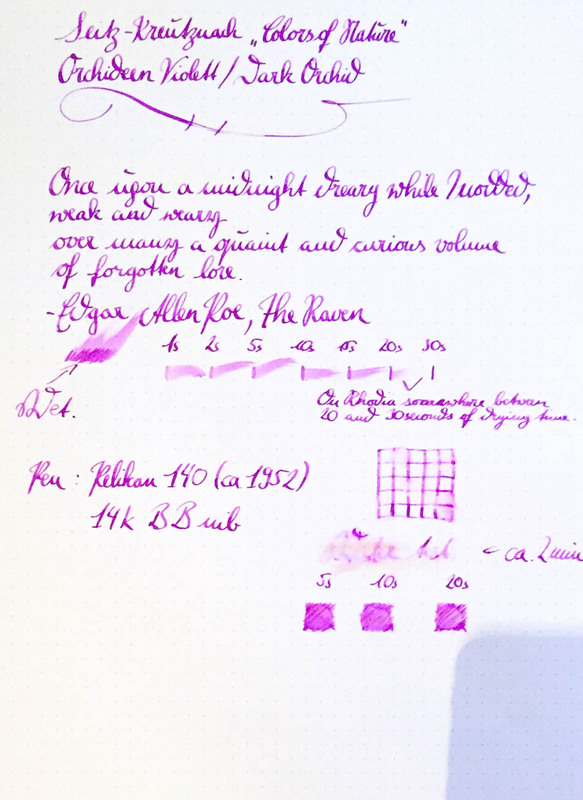 This is a nice, well-behaved ink. In Germany the 100ml bottles sell for 8,99€, which equals approximately $10US That makes $0,10US per ml. Even without considering the beautiful color and the awesome features, that is a great deal. I can recommend this ink to you without any reservations.